Crédit Agricole Platinum Credit Card combines the beauty of credit card privileges with worldwide recognition and special treatment. Crédit Agricole Platinum Credit Card members enjoy higher credit limits, for high spending power inside Egypt and abroad. 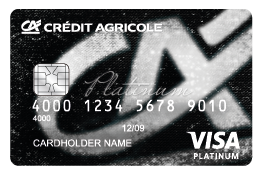 Around the world, Crédit Agricole Platinum Credit Card members are welcomed, respected and well received. It protects goods purchased by Crédit Agricole Platinum Credit Card within an automatic extension of the manufacturers or retailers warranty for up to 24 months from the item’s purchase date. A short-term policy to cover items purchased by Crédit Agricole Platinum Credit Card against loss, theft and/ or accidental damages. For more information regarding Extended Warranty and Purchase Protection Coverage, Excluded Items, General Rules & Contacts. We understand that health is important to the platinum card member as an Elite. In view of this, Crédit Agricole would like to line up an array of medical services, so as to ease his/her worries at critical moments. For more information regarding Medical Referral. Crédit Agricole Platinum Credit Cardmember can be provided through this service with the names, addresses, telephone numbers and office hours for referred lawyers and legal practitioners. For more information regarding Legal Referral. Worldwide Acceptance Crédit Agricole Platinum Credit Card is accepted at more than 32 million merchant locations worldwide and more than 1 million ATMs for 24 hours cash access. Flexible Repayment Platinum Credit Card members have the option to pay as little as of 5% of their total bill. Interest-Free Period Crédit Agricole Platinum Credit Card offers up to 56 days interest-free period on purchases. Credit Shield Insurance Crédit Agricole Platinum Credit Card members enjoy an optional credit shield insurance of 0.08% of their monthly outstanding balance.